Coriander leaves are a great source dietary fibre, iron and magnesium. They are rich in phytonutrients and flavonoids. 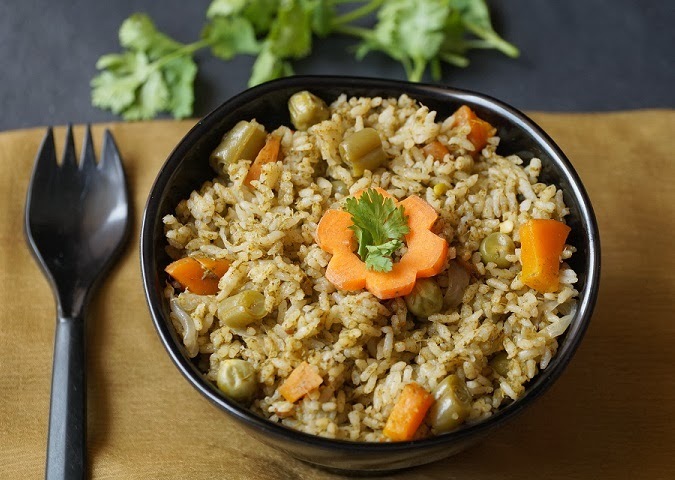 This biryani is a delicious way of adding this leaves to our diet. It is an easy to make one pot meal prepared with freshly ground masala. Wash the rice and soak for 20 minutes. Grind the ingredients under “to grind” to a fine paste. Clean the coriander leaves, wash and grind it to a smooth paste adding very little water if required. Chop the onion. Heat the oil and ghee in a pressure cooker. Add the cinnamon, cloves, black stone flower and bay leaf. Now add the ground masala and sauté till raw smell is gone. Add the chopped onion and whole green chilies. Once the onion turns transparent add the coriander paste, curd and veggies. Mix well. Add water and salt. Once it boils, check for salt and add the rice. Close the lid and cook for 3 whistles. Serve with any raita. 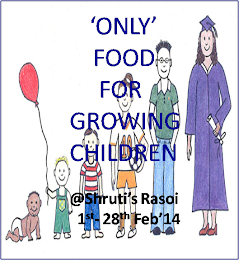 This is sent to only food for growing children at shruti's rasoi started by Pari.